There’s the steel-eyed intensity. The voice as deep and black as night. The blistering songs of heartache and survival that drove like a freight train through the 1950s pop culture, blazing a new trail for rock, country, punk, folk and rap stars to come. And in a year that marks the 50th anniversary since the guitar-slinging singer walked into the soon-to-be famous Sun Studios in Memphis, Johnny Cash remains the sole entertainer inducted into the Country Music Hall of Fame, the Rock and Roll Hall of Fame and the Songwriter’s Hall of Fame. He would come to symbolize treachery, sin, hope and faith as he moved past his own raw anger, the ravages of addiction and stardom’s temptations to discover the voice that made him a hero to generations. This month’s release of “Walk the Line” — director James Mangold’s story of the young Johnny Cash and his incendiary lifelong love affair with June Carter Cash — caps a yearlong Cash commemoration that comprised a bevy of books, a series of CMT and PBS specials, a major Broadway play and a CashBash fan-based grass-roots celebration in the city where it all began. Throughout the U.S. and all across the globe, the curtain rose on the giant of a man who faced down his demons, fought for the love that raised him up and learned how to walk the razor-thin line between destruction and redemption. Nearly ten years in the making, Walk the Line was in development for seven years with the close cooperation of Johnny Cash and June Carter Cash before their deaths only months apart in 2003. Produced by Cathy Konrad and James Keach, the film stars Academy Award and Golden Globe nominee Joaquin Phoenix as Johnny Cash and Golden Globe nominee Reese Witherspoon as June Carter. Opening in Depression-era Arkansas, the story traces Cash’s sound back to his beginnings as a sharecropper’s son and moves through his wild tours with rock and roll pioneers Elvis Presley, Carl Perkins, Roy Orbison, Jerry Lee Lewis and Waylon Jennings, culminating in the unforgettable 1968 Folsom Prison concert. At the film’s core is the passionate, revved-up music that conveyed the good humor, the startling roughness, and the cockiness and urgency that shook crowds when guitarist Luther Perkins, bassist Marshall Grant and the young Cash first played. Dennis Devine first met Cash in 1960 and has taken more than 4,000 photos of Cash, his family and entourage. Devine’s mother, who first introduced her son to Cash’s music in 1955, died this year on Sept. 12, the 2nd anniversary of Cash’s death. Council Bluffs, Iowa, native Dennis Devine, Sr., who first met Cash in 1960 and developed a close relationship with Johnny’s family and entourage, worked with 20th Century Fox and Council Bluffs’ Star Cinema in orchestrating the film’s premiere there Friday, culminating in an all-day event that included KOIL Country djs, live musical performance, a spinning wheel with prizes and three back-to-back screenings. The film’s festivities marked the fourth Johnny Cash celebration Devine organized this year, most recently on Sept. 12, the second anniversary of Johnny’s death, when the new street he’d proposed 18 years earlier — Johnny Cash Drive — was unveiled outside the Rock Island Depot in Illinois. In an ironic twist of fate, Devine’s 86-year-old mother, Della, passed away that same morning; 50 years earlier, Della had sent the 16-year-old Dennis on a journey from Giltner to Hastings, Ne., to purchase Cash’s “Cry, Cry, Cry,” which she’d heard on the radio, and sparked Devine’s lifetime love and respect for the Man in Black. Devine, who attended both Johnny and June’s funerals, believes his mother’s passing on that day resulted more from divine intervention than anything else. An antiques dealer and history buff who attended more than 125 concerts, Devine has taken more than 4,000 photos of Johnny Cash and had many of those on display Friday for the film’s premiere, along with hundreds of other Cash memorabilia. Sharon Graves of Grand Island, Ne., who purchased Johnny’s $131,200 custom made guitar during Sotheby’s auction last year, lent the Billy Grammer original to the event as well, which musicians Keith Anderson and Kent Thompson played before the energized crowd. All three screenings completely sold out, and Devine said the movie stayed true to factual events and Cash’s two autobiographies — 1986’s “Man in Black : His Own Story in his Own Words ” and 1997’s “Cash: The Autobiography ” — on which the film was based. 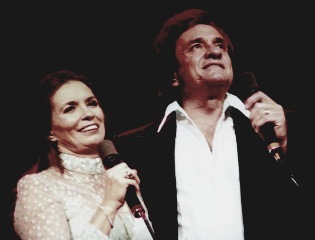 Johnny and June Carter Cash were said to be “inseparable” by those who knew them best. From the beginning, director Mangold says he saw a chance to tell a quintessentially American tale, choosing to focus on the years spanning Cash’s impoverished boyhood, his rocketing rise to stardom, his near fall from grace, and his remaking himself as a legend. Stars Phoenix and Witherspoon sing every note of their roles themselves, and the film’s supporting cast includes blues artist Shelby Lynne, who makes her feature debut as Johnny’s mother, Carrie Cash; rock and blues artist Waylon Malloy Payne who plays Jerry Lee Lewis; country-rock artist Shooter Jennings, who portrays his real life, Waylon Jennings; Johnathan Rice as Roy Orbison and rising singer Tyler Hilton as Elvis Presley. 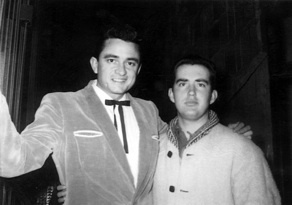 “If [Phoenix and Witherspoon] don’t win an Academy Award, then there’s no justice,” says Devine, one of only two “fans” that wrote chapters for “I Still Miss Someone: Friends and Family Remember Johnny Cash ,” former Cash road manager Hugh Waddell’s tribute compilation of stories by those who knew Johnny best. Devine provided some of the photos for Waddell’s book, and many of his snapshots also are included in three books written by Peggy Knight, who spent 33 years doing what many could only dream about: living and traveling with Johnny and June on a day-to-day basis. In 1967, Peggy Knight walked into a VFW Club in Nashville to play bingo, and by chance met a woman who would change her life forever: Mother Maybelle Carter, whose daughter June had just married a man named John. Maybelle and Peggy became fast friends, bingo and horse racing buddies, and when Maybelle’s husband, Eck, became ill in 1971, June asked Peggy to help out. In 1972, with Eck in and out of the hospital, Peggy began spending the night with Maybelle at June’s request, and when Mr. Carter died in 1975, June once again called on her mother’s best friend. “Honey, I know you’re single and got your own life, but I wonder if you would consider living with Mama,” June asked. Peggy Knight spent more than three decades living with and traveling with John and June Carter Cash. She pays tribute to their loves and lives in three very different books. When Mrs. Carter died three years later, Johnny and June brought Peggy into their own family fold where she assumed a multitude of roles: special friend, trusted colleague, traveling companion, confidant, cook and shopping partner. In “Cooking in the House of Cash ,” Knight shares over 100 recipes of the Cash family’s favorite dishes, complete with full-page color photographs. “They were country people who wanted country cooking, especially my biscuits,” says Knight, the seventh of 12 children who quit school at age 16 to help her mother support the family. “At Home with Johnny, June and Mother Maybelle: Snapshots from My Life with the Cash and Carter Families ,” Knight’s first book compiled in photo-album style, is a collection of some of her favorite pictures from over the years with short text describing the who, what, where and why of each photo. Like the cookbook, the album features dozens of glossy color photos, including those of June with her autoharp, family trips to Paris, backstage snapshots and the Cashes with close friends George Jones and Waylon Jennings and many others. Premium Press America’s George and Bette Schnitzer worked closely with Peggy on all three books, as did Armour & Armour’s Joan Armour, who helped Peggy with the writing. Many of the books’ photographs had never been published before, which George Schnitzer says contributed largely to the three separate projects. Ironically, he said, the cookbook began doing slightly better in sales than the hardback, and he suspects there’s a good reason: it includes Johnny Cash’s super spicy chili recipe. The recipe — the only thing John ever cooked — used five pounds of sirloin steak or deer meat and a long list of ingredients including chili peppers and cumin. The directions state to “Serve with soda crackers and Pepsi or Coke,” with the final comment: This will serve 12 people, three helpings each. It turned out to be a win win situation for everyone involved. Premium Press’s new display racks for Knight’s “My 33 Years Inside the House of Cash” now read, My book starts where the movie ends. Over the course of his career, Johnny Cash recorded over 70 albums and has sold more than 50 million records. He has won 11 Grammys, the most recent the 1999 Lifetime Achievement Award and the 2002 shared Grammy for Best Country Album. 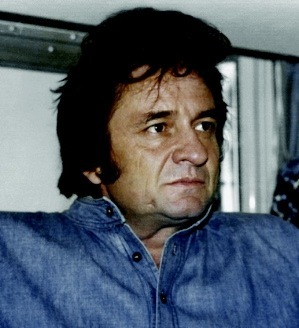 Apple’s iTunes carries 66 of Cash’s albums available for download, and 1999’s “16 Biggest Hits: Johnny Cash” is not only Cash’s top-selling album there but currently iTune’s #2 top-selling album. Johnny Cash is everywhere these days. A recent USA Today headline read, “Even in Death, Man in Black Looms Large.” Last year — even before the film’s release — Forbe’s Magazine cited Cash as one of the top-earning deceased celebrities, and his fan base continues to grow stronger by the day. This article first appeared in the Weekender on November 24, 2005. 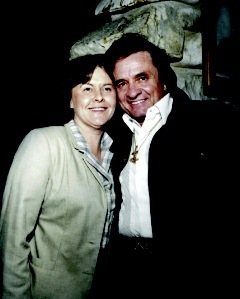 Peggy Knight was fired by Johnny Cash near the end of his life. Interesting, JD. I think she still dearly loved both Johnny and June.